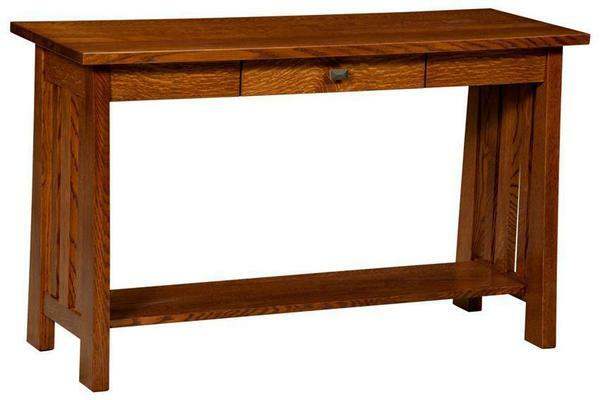 Our Amish crafted Freemont Mission Open Sofa Table is beautifully constructed from solid wood. This mission-style occasional table will add a distinctive flair to your living room or office. It features a 1-inch thick square top with a Mission edge and full extension drawer slides. Available in a variety of wood species, choose from round wood knobs or bungalow hardware (shown) to accentuate the drawer. Want a matching set? Check out our Amish Freemont Mission Open Coffee Table and Amish Freemont Mission End Table. 48" x 18" x 29"